Skills are divided into three categories: personal, party, and leadership skills. All skills range from level 0-10 (although for party skills, the effective level can exceed this with bonuses). Skills can be improved by spending skill points. Some skill points are given during character creation, one skill point is earned per level up, and also one extra skill point is rewarded per attribute point spent on Intelligence. Each skill has a base attribute that limits the skill to 1/3 of the attribute's value (rounded down). For example, with a STR of 14 Ironflesh may not exceed level 4. Starting at STR 15, Ironflesh may be increased to 5. These attribute limits can be surpassed using bonuses from books, but cannot exceed level 10. These are skills you or a companion can possess. They don't affect the party. At early levels it isn't very important, but as you fight tougher enemies every bit of protection helps. This skill has a very large effect on determining whether an NPC survives autoresolved combat. More powerful throwing weapons cannot be used until this skill is sufficiently high. Effect: +14% bow damage for each point (up to 4 plus Power Draw requirement of the bow). Also increases how long the character can aim for before losing accuracy. This is required for the more powerful bows, and is overall a valuable skill for making archery less difficult. You will benefit from up to four points in this beyond the power draw requirement of the bow (if any). Effect: Each point increases by 40 the limit at which weapon proficiencies can be raised with weapon proficiency points. Also increases the rate at which proficiencies are improved by use in combat. This skill allows you to continue using weapon proficiency points after you have passed the normal cap. This cap is only for the purpose of spending additional proficiency points; using weapons in combat will continue to raise your skill regardless of what the proficiency cap is set at, but it will do so faster at higher levels of Weapon Master. Effect: Reduces damage to shields by 8% per level and improves shield speed and coverage. Due to a bug, raising this skill also raises the Shield skill of enemies, and is therefore a poor choice for characters who make use of ranged weapons. This bug is fixed in Warband. This isn't very obvious early on, but with a few levels it will start to really take effect. This skill is made less important by having a horse, but it's still a useful backup if you lose your horse or if you want to fight on foot. It is also useful during sieges and tournaments, where a horse might not be available. Note that the combined weight of your armor and equipment will reduce the speed bonus your Athletics skill grants. The goal of the following analysis is to provide an accurate account of the effects of the athletic skill. To acquire this data, a contributor performed a series of timing measurements from a specific point, A, to a different specific point, B, in the game world. Different encumbrances and athletic skill points were used. Therefore, running speed is not known in units. Speed is only known relative to another based on Athletic skill and encumbrance differences. This contributor did not test for speed increase of more than base running speed. All calculations are an estimate. Agility attribute during the measurements was 15 or 18. Running speed increase per Athletic skill level is linear. Running speed change (+/-) per unit encumbrance is linear, and a decrease in running speed from encumbrance occurs at greater than 0. Base running speed = running speed at 0 encumbrance and 0 Athletic skill. 50 units of encumbrance decreases running speed by about 22%, or .44% speed reduction per 1 unit. 1 Athletic skill point is equivalent to about 4.16 units less encumbrance, or 1.83% increase in running speed. Encumbrance 50 with 0 Athletic skill points reduces base running speed by 22%. Encumbrance 50 with 2 Athletic skill points reduces base running speed by 18.3%. Encumbrance 50 with 4 Athletic skill points reduces base running speed by ? ?% (estimated 14.64%). Encumbrance 35 with 0 Athletic skill points reduces base running speed by 15.4%. Encumbrance 35 with 4 Athletic skill points reduces base running speed by 8.1%. Effect: Increases riding speed and maneuver, allows riding of more difficult horses. Effect: Reduces penalties for using ranged weapons on a moving horse by 10% per level. Reduces the aiming reticule spread while mounted, allowing for much greater accuracy. All ranged weapons: bows, crossbows, throwing weapons and firearms are affected by this skill. 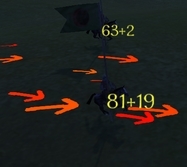 Note that the negative effects of being mounted and using ranged weapons are only applied while you are actually moving, thus this skill has no effect if you are mounted but stationary. Experience points are not given to party members that are fully upgraded. If multiple companions have this skill they will each help train party members. This skill also helps you train peasants against bandits faster. The total experience points given to a soldier is the amount from the training skill multiplied by the number of levels the player or companions are over the soldier to be trained. For instance, if you are level 30 and have 1 point in training and are training a level 1 recruit you will give 116 experience points to the recruit. That's 30-1= 29. Training level of 1 gives 4 points of experience. 29 X 4 = 116. Stack this with companions and higher skill levels and you will be able to train even the highest tiered troops relatively quickly. These are skills that each character individually possesses, but they are applied to the party as a whole. If the party leader (you) has these skills, a bonus to the skill is applied as per the table to the right. The leader's bonus is applied to the party even if a companion has a higher skill level than you. An additional (+1) can be earned from certain Books. If characters are listed as Wounded their Party skills will be disabled until they regain some health. Increases the amount of loot obtained by 10% per skill level. Looting also increases the quality of the loot. For example, at level 1 looting you will find mostly rusty, broken and cracked prefixes, negative ones. If your looting is 10, you will find more items with positive prefixes such as balanced, reinforced, or tempered. This skill works in village looting, and in any other battle or siege. It also increases the number of cattle obtained when stealing them from a village. Effect: Makes onscreen tracks appear and gradually become more informative. Also increases the distance at which tracks can be seen. This skill makes tracks appear on the world map, gradually becoming more accurate and providing additional information. At level 1 the tracks indicate party movement, but little else. As levels progress the accuracy of party size predictions and hours the tracks remain visible for increases. Tracks will also gain colors, allowing you to easily follow a particular path regardless of what other paths it crosses. Effect: Every 2 points to this raises your battle advantage by 1. Before each battle your Tactics score is compared to that of the enemy leader, and this determines how many men each side has at the beginning of the battle. Additionally, if you choose to send your men in while you stay back or are knocked out during battle this skill will have an effect on the aftermath losses. This skill also reduces how many men you need to leave behind if you retreat. Effect: Increases party map speed by 3% per level. Effect: Increases party sight range by 10% per level. Effect: Increases party healing speed 20% per level. Also applies to the healing of crippled horses in the inventory. Effect: Each point adds 4% to the chance that struck down troops will be knocked out rather than killed. This is added to a base chance of 25%. This skill is quite useful for giving your troops the best chance you can to reach higher levels and become effective fighters. It also lessens the annoyance factor of spending top dollar on some new, high tier troops only to have a significant fraction of them be killed in their first battle. Effect: Heroes regain 5% per level of hit-points lost during a particular battle. This is added to a base rate of 10%. This skill takes effect both between battle waves and after combat is over. This only heals up to the level of health before you entered battle, so if you go into battle with low health you can only heal back up to that level and no further. This skill also affects the cost of building village improvements. The Trade skill reduces the cost penalty applied to buying and selling. See Trade for more details. Trade also reduces the time it takes to collect taxes for tax collection quests. These skills affect the party, but only if the person with these skills is the party leader. Very important when pillaging villages or attacking caravans. Effect: Helps you make other people accept your point of view. There is a random factor involved in determining how successful you are. Useful for persuading Lords to pay debts or support peace. Also used for persuading lords to rebel and reduce chances that recruited prisoners will run. Perhaps most importantly, it can be used to keep your companions from leaving your group due to low morale. Needed if you want to recruit or sell prisoners. Also needed for the Bring Prisoners quest. This skill has no effect for NPC lords, who have no limit to the number of prisoners they can take. Effect: Increases party capacity by 5, boosts party morale by 12, and reduces troop costs and wages by 5%. The higher your Leadership, the more men you can lead into battle. You'll probably want to put a point towards Charisma every other level or so, and a point towards Leadership every chance you get. Increasing your Renown will also raise the party size cap. This page was last edited on 17 October 2013, at 16:33. This page has been accessed 182,352 times.